The Gangster's Daughter is a touching tale. For a film that talks about gangsters and their lives, the film really has a huge heart at its centre. Taiwanese documentary filmmaker Chen Mei-juin's "The Gangster's Daughter" is her first narrative film. 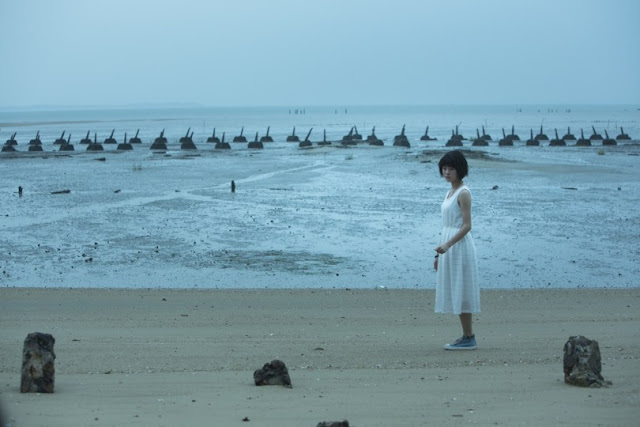 Showing a great eye for both the rural and urban lifestyle, her film follows the life of Shaowu (Ally Chiu), a rebellious teenager who has just lost her mother only to be reunited with her estranged father, who also happens to be a renowned gangster. Shaowu, which also translates to 'dance', is not the usual teenager. When living in Kinmen Island with her grandmother, she spends most of her time in her secret bunker and watching gangster films (also imitating them). When asked about her hobbies at her new school in Taipei city, her unusual reply of collecting 'bullets & guns' worries us. Thankfully, Mein-Juin's film doesn't follow the conventional gangster films. While guns, bullets and gang violence does feature later on in the movie, it never really becomes the focus of it all. Chen Mei-Juin's film is about a fading gangster. One who has been hot-headed all his life only to be away from things that mattered to him the most, i.e - his family. He is trying to go straight for the sake of his daughter who becomes an essential part of his life after she moves in with him. Then again, it's not really about that. The film is a beautiful, often sad coming-of-age tale of a girl coming to terms with what she and her life really mean. A film such as this one needs support from all grounds. Technically the production is brilliant. The sound design, the cinematography and every other supporting character fit right in. For instance, the hot-headed prodigy of Keiko takes care of his father and when he eventually faces his fate, you feel emotionally attached to him. The only problem I had was the dreamy indulgence of shots when things go south for Shaowu & Keiko. The emotional impact becomes redundant which is really disappointing, having developed such a beautifully etched out story that drives you there. The film also works because of the performances. Jack Kao, also known as the Taiwanese Al Pacino, packs in a balanced performance both as a fading gangster (one who is calmer to the sense of things around him) and as a loving father trying his best to bond with the girl he left behind. Ally Chiu is absolutely adorable as the young feisty teenager learning the ways of life through her experiences. For a coming of age tale, the film already shows her in the learning phase when we don't see her crying at her mother's funeral, but when she has to leave her grandmother. Her character is written with solid nuances and Ally Chiu does extraordinarily well in doing justice to it. The "Gangster's Daughter" is a touching tale. For a film that talks about gangsters and their lives, the film really has a huge heart at its centre.